There’s nothing better than a hot bowl of soup on a chilly winter evening. This hearty, earthy, woodsy, robust soup is a meal in itself. Serve with your favorite Temecula Valley wine. Heat the butter and olive oil in a large pot, over medium-high heat, until the butter begins to sizzle. Add the shallots and garlic. Cook for 1 minute until the garlic is slightly browned. Add the mushrooms and cook, stirring occasionally, for 4 minutes or until tender. Add the beef stock and bring to a simmer. Reduce the heat to medium and simmer for 10 minutes. Add the cream and bring to a simmer again. Stir in the flour mixture and simmer for 3 more minutes. Season with salt and pepper to taste. Serve the soup hot, topped with croutons. Preheat the oven to 375 degrees. Put the bread, Parmesan and thyme in a large bowl. Drizzle with olive oil and toss until combined. Spread on a baking sheet and toast in the oven for ten minutes. Bel Vino Winery ~ 2010 Merlot – Medium to dark color presents aromas of cloves, cassis, with dark and jammy fruits. Longshadow Ranch Winery ~ Merlot (unfiltered) – An extraordinary red the way it was meant to be. Gorgeous and full of life with a fruit forward finish. Mount Palomar Winery ~ 2011 Merlot – Scents of daisy, cocoa, cherry and prominent tastes of plum and black pepper. Oak Mountain Winery ~ 2011 Merlot – Soft nose, with flavors of raspberry, blackberry, and plum with abundant smoky oak. Holiday shopping nights, Santa visits, tree lighting events and special holiday meals; you’ll find it all in Temecula Valley Wine Country! We raise a glass of cheer and wish you all a very happy holiday season! Thursday-Sunday / 11:00a-2:30p / Tours and vertical tasting of library Meritage. Sit down with bread and cheese plate; $30 (Reservations required 24 hours in advance) Bar Tasting; $20. Call for reservations: 951-972-9768. Friday, December 5 / 5:30p-9:00 / Experience amazing sunsets and live music by Buzz Campbell while enjoying fabulous food and wine. Food items available for purchase. Call 951-308-1098 to make reservations. Seating is limited. Thursday, December 4/ 6:00p-9:00p/ at the Lounge at Meritage at Callaway / A creative life needs to be lived out in the OPEN; heard and shared with others. Join us for an evening of tapas, wine & creative collaboration. Call 951-587-8889 or e-mail stefano_butto@callawaywinery.com for more information. Sunday, December 7 / 3:00p-5:00p / Join us as we light our Barrel Tree and celebrate the holiday season. Santa will be here to take photos with the family. Wine tasting for the adults and hot cocoa & cookies for the children will be available; and the gift shop will be open for all to shop. No reservations required. Wednesday, December 10 / 5:00p-8:00p / Sip and shop at Callaway during the only late night shopping night. Mingle with friends, wine taste and shop for unique wine themed gifts! Get recipes for holiday treats and entertaining ideas to help celebrate the holidays with ease. Open late Friday, December 12th. With live music from 5:00p-8:00p. Listen to Will Sumner’s smooth jazz. Paid wine tasting until 6:00p, then wine by the glass and bottle sales for the remainder of the evening. Enjoy extended shopping hours in our tasting room during the first three Fridays in December. In celebrating our 10th Anniversary, we will feature special wine packages and gift item promotions during extended shopping hours. Thursday, December 11 / 6:00p-9:00p / $125+ tax, per person / $115+ tax, per person wine club members / Featuring The Restaurant Chef Daragh Matheson, Banquet Chef Michael Cragg and Winemaker Tim Kramer / 8-Course Wine Paired Dinner and live entertainment from musician Jason Weber. Fridays 5:00p-8:00p in the Restaurant at Leoness / Sundays 1:00p-4:00p on the patio. Tuesday, December 16 / 6:00p / No cost to attend. Thursday, December 18 / 6:00p / Join Lorimar for a holiday party to remember! Wear the ugliest sweater you can find to enter the contest for a prize! No cost to attend. Monday, December 29 / 5:30p / Featuring: When Harry Met Sally $1 Admission – Includes small bag of popcorn! Wine Bar and Concession stand will open at 6 pm. Bring your own beach chair or blanket! December 3, 9, 14, 18, 22 / 11:00a-2:00p / December 14th class is from 12:30p-3:30p / $45 per person – includes a glass of wine! (Discount given for multiple guests) / To sign up or for more information, please contact Dorothy Hawthorne at 951-302-3088 or doughawthorne@verizon.net. December 1-31st / The talented chefs at the Vineyard Rose Restaurant have put their toques together and have created this stunning appetizer for December. Offered up as the “Temecula Chilled” appetizer for both lunch & dinner, this special is sure to please: Crab Stuffed Deviled Eggs, Chilled Poached Prawns, Sriracha Cocktail Sauce. Every Monday 5:30-9:00p / Enjoy half-priced bottles of award winning selected wines with the purchase of two entrees. Indulge in a 50 minute Cranberry Facial and protect your beautiful skin with the anti-aging properties of antioxidants. Experience the glow of revived and rehydrated skin. Deliciously priced, this beauty indulgence is yours for just $89 – only through December. Call 951-587-9463 ext. 3515 to book today! Be sure to visit us Friday through Sunday evenings through December 21st and enjoy strolling Christmas Carolers dressed up in Vintage attire at South Coast Winery Resort & Spa. 5:30 to 9 PM. Free to public. Wednesday, December 10 / 5:00p-8:00p / The gift shop at South Coast Winery Resort & Spa is extending their hours for late night holiday shopping. Wednesday, December 24 and Thursday, December 25 / 5:30p-9:30p/ Reserve your place today for Christmas Eve and Christmas Day at the Vineyard Rose restaurant. We’ve decked our halls and our elves are ready to cater to your every need while you and yours delight in our chefs’ culinary creations designed to delight and dazzle. Wednesday, December 31/ 7:00p-12:30a / Enjoy a delectable five-course dinner and bottle of award winning select South Coast Wine. Includes a South Coast Sparkling Wine Toast and Balloon Drop at Midnight. Just $165 per guest plus tax and gratuity. Special room packages also available at an additional rate, based on availability. Reservations are A MUST, so call today: 951-587-9463. 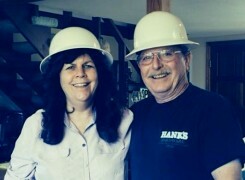 Steve and Val hard hat-ting it! Our ongoing series this month features Steve and Valerie Andrews of Oak Mountain Winery. Val’s dad and uncle were in the gourmet wine business back in the 60’s, way before it was popular. And all it took was a wine tasting trip with Val’s dad for Steve to get bit by the winemaking bug. Why (on earth!) did you get into the wine business? Well, we were already in love with the wine industry. We lived on 10 acres, so we just decided to plant it and try our hands at making some. Next thing we knew, we had three wine barrels of some pretty awesome wine and we just decided it was time to open a winery so we could actually sell all this liquid gold. That was the beginning of our home winery, Windy Ridge Cellars (now Temecula Hills Winery) in 2001. Well, we lived here – and the climate is great for growing grapes. After several years of operating out of our home winery, we purchased the property where we now have Oak Mountain Winery. We’ve been open since 2005. So what’s it really like running a family owned and operated winery? If you don’t love what you do you will never succeed in running a winery. We work seven days a week; 10-12 hours a day. But we DO love it! What is it you MOST love? We love the people we meet, the other winery owners and the lifestyle we live. We love the continuing education we receive at seminars – and what we learn from talking to other winemakers and owners. We love that there’s endless opportunities that the winery can offer to our guests. It allows us to be creative in our label designs, our tours and special deals, and our parties and events. We make each of them our own. For us it’s a shared interest we both love to explore. So, on the opposite side of that, what keeps you awake at night? There are challenges with running a small family business. The mix of all of our family’s personalities – working together every day – it’s a challenge for sure. But we like challenges! And, it makes us happy almost all of the time. And the Caves! What does it mean to have (almost!) completed a project of this magnitude? I mean, really! How lucky are we??? The caves. A huge insightful undertaking! Two years in planning and nine months of digging. We’re still looking at about three more months to finish up all the little details. There is nothing like this in Southern California. When you get the chance to tour our caves, we promise you that you’ll feel like you’re on a mini vacation to Europe; like being sent back in time. We’re so excited and proud to have the first mined cave in Southern California. We just can’t wait for it to be finished! Nothing screams “Harvest Time!” more than a good old-fashioned grape stomp! September is always a busy time in Temecula Valley Wine Country; besides celebrating California Wine Month with the SIP Passport and annual CRUSH event, our wineries have a few celebrations of their own up their sleeves. You won’t want to miss all the excitement; plan your visit today! Here are just a few of the events happening. Live music, 1/2 price bottles of Sangiovese, food pairing featuring their new “Sangiovese Burger”. Sangiovese Sangria by the glass of carafe. Buy a “Sangiovese Saturday” t-shirt, wear it when you come back and get a free glass of Sangiovese. Bring your well-mannered pooch to lunch! Live acoustic entertainment. A preview of Baily’s outstanding 2011 Bordeaux Varietals at their exclusive production facility and Estate Tasting Room. Experience a private winery tour, get a glimpse of the 2014 harvest activities and special case pricing available (mix and match!) Call for reservations: 951-972-9768. Live music by Buzz Campbell and fabulous food and wine. Call 951-308-1098 to make reservations. Seating is limited. Three-course Prime Rib dinner for $35 per person! Special wine discount of 20% off Callaway wines by the bottle. Live music beginning at 6pm Reservations are not required. Every Sunday from 4pm-8pm Watermelon Sangria and live music from. No cover charge and no reservations required. Sunday, September 28 / 3:00p-5:30p / Cooking demo, class, & small plates. Wine pairings and recipes to take home / $55 per person / $$49.50 per person, wine club (all tickets are subject to 8% sales tax). Call Kelly at 951-302-6363 ext. 26 for reservations. Every Sunday in September from 12:00p-3:00p. This class is designed for all ages and levels of wine knowledge. Individuals can expect to learn about wine tasting, wine production, wine & food pairing and wine quality determination. Plated meal in the vines, wine, live music, dancing and stomping! Join friends and family for our most anticipated event of the year! For reservations, either call 951-216-7305 or e-mail to reservations@leonesscellars.com. To assure your space, please RSVP no later than September 13, 2014. $1 Admission – Includes small bag of popcorn! Wine Bar and Concession stand will open at 6 pm. Film begins at Sunset on the Barrel Room Lawn! Bring your own beach chair or blanket! Monday, September 29 / Featuring: Willy Wonka & the Chocolate Factory / $1 Admission – Includes small bag of popcorn! Wine Bar and Concession stand will open at 6 pm. Film begins at Sunset on the Barrel Room Lawn! Bring your own beach chair or blanket! Saturday, September 27 / 6:30p / Adults $34.95 / Kids $14.95 (4-13) Grape Stomp contest & prizes, outdoor BBQ, live entertainment, games, balloon glow and much, much more. Bubbles 101 – Learn fun facts you always wanted to know about sparkling wines and champagne. Bordeaux Wine Class 201 – You will learn how these grapes are grown and how they are harvested and processed. Sunday, September 29 / 4:00p-9:00p / Gourmet food, wine music and a Stomping Good Time! Whether it’s a special celebration or an intimate affair, our Chef’s Table dinner for 2 to 8 guests will define the art of fine cuisine with a memorable evening of food and wine for only $135 per person. Call 951-491-8077 to reserve your table today. Specially priced $9.99 lunches for those aged 55 and over. Call 951-587-9463 x 2 for more information or reservations. Enjoy half-priced bottles of select featured wines with the purchase of 2 entrees. Call 951.587.9463 today or visit here. 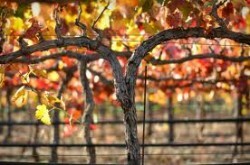 Daily / 11:00a and 1:00p / Get up close and personal with the real workings of a winery during a harvest crush. This $40 walking wine tour culminates with a private, plated wine & cheese pairing. Wine Club Members, enjoy the tour for just $35 per person. Reservations strongly suggested: Call 951.587.9463 x7219.